Hi! 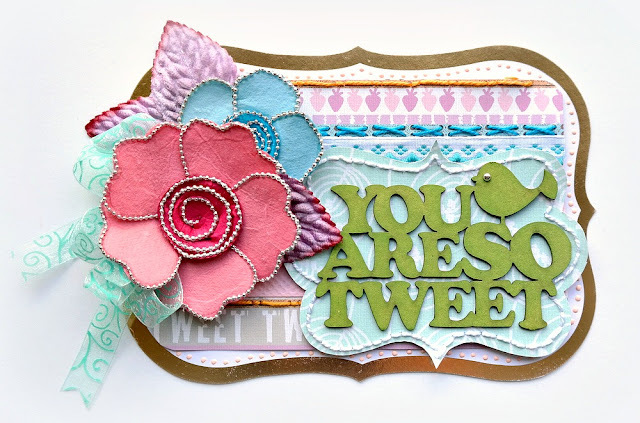 I created this card for FabScraps using their delightful new Woodland Friends collection. The dreary days of Winter have set in, but this colorful line has me thinking Spring! Several of the patterned papers have a stitched pattern and I thought it would be fun to highlight that design element with some hand-stitching over the top. I was thrilled to be able to create a colorful flower cluster that included purple leaves! The extensive chipboard range that is part of this collection made adding a sentiment to this card super easy. If you'd like the full supply list and/or detailed instructions to make this card, please visit the FabScraps blog. Loveeeeeee this! LOVING the colors and the flowers!!!!!!!!!!!!!!! !